A few comments from some satisfied customers! Thanks for a great day out in London. We’ve walked by many of the them for years not realising their significance, history, or that they were actually right under our feet! You were good company and we will be back if our wives will let us! 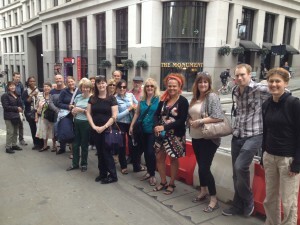 My wife treated to me to a personal London finance tour for my birthday and had such fantastic time. A very interesting informative tour of the modern architecture of London! Our guide Andy both educated and entertained us, he had stories about the buildings, the architects as well as about the history behind. We were a small group, only 5 persons, which gave us lot of space to ask questions and talk. Don’t think we would have visited all these places without this tour, we hadn’t even heard of them all. So much more interesting than going to those regular sites of London. Thanks SO VERY MUCH for super tour today – everyone thought it was excellent! We will definitely of course see you again – wouldn’t dream of booking anyone else if you’re available!